As an athlete I’m sure that you know that sports are as much a psychological battle as they are a physical challenge. Performance anxiety and other mental problems often lead to muscle tension. Tense muscles require much more energy to operate. Furthermore, a confused, anxious athlete will not be able to respond dynamically to unexpected challenges. There is a huge body of evidence that relaxation, visualization, anchoring and various other mental strength training techniques can vastly improve sports performance. Athletes who use mental strength training often report rapid improvements, not only in performance but in general mental attitude and the ability to respond easier to changing situations. If you read some of the articles out there on this subject you will find dozens of success stories from athletes. For example, a golfer lost over 600 professional tournaments before turning to entrainment and visualization, and won soon after! More than a few athletes have tripled their earnings using this technology. The evidence for sports performance enhancement through mental strength training is particularly prevalent because coaches are now recognizing the importance of psychology in sports, and develop relaxation and visualization regimens for their athletes. Is Mental Strength Training Useful For Athletic Performance? Many athletes and coaches are confused about the role of mental strength training in improving athletic performance. Mental strength training is part of the larger field of sport science and studies human behavior in the sport environment and the benefits of mental training on enhancing sports performance. The goal of mental strength training is to help athletes and teams perform their best by improving the necessary mental skills to excel in their specific sport. Mental strength training is not about working with problem athletes or abnormal behavior. Mental strength training concentrates specifically on assisting athletes to break through the mental barriers that keep them from performing up to their peak potential and by teaching mental skills for success. By focusing on the mental strategies needed to be successful in any competition, mental strength training seeks to achieve the overall goal of performance improvement and enhancing consistency in performance. I prefer to use the tile “mental strength training” because I think athletes can relate to this better than other descriptions. My professional background is in neuro-linguistic programming (NLP), personal coaching, sports hypnotherapy, mental skills coach, Timeline Empowerment®, strength and conditioning and personal training. My experience also comes from the sports world as a former athlete, coach, and for the last several years, as a mental strength coach to competitive, tactical and combat athletes. My role is to help athletes develop mental strength skills for peak performance. I work with driven and committed individuals who are under additional perceived pressures to perform in their sport. My goals are to teach athletes how to be more confident, focus better, stay composed under pressure, practice more efficiently, and develop more effective pregame routines. I become an extension of the athlete’s support team. A myth that most athletes maintain is the view that mental and physical aspects of sport are separate. Some athletes falsely belief that you must first master “perfect” technique or mechanics before you can work on attitude, mindset, or mental skills. It has been scientifically proven, and it is my philosophy, that you cannot separate the mental from the physical when it comes to performance or any behavior for that fact. Decisions, thoughts, images, and feelings drive motor behavior. Mental strength training helps athletes develop confidence and focusing skills in conjunction with the mastery of the technical aspects of sport. How Do You Know You Could Benefit From Mental Strength Training? Are you performing up to the ability you have shown? Do you perform as well in competition as you do in practice or qualifying? Are you so self-conscious that you worry about what others think about your performance? Do you have any doubts about your sport before or during competition? Do you get so anxious that you don’t have a calm mind or think straight in competition? Are you motivated by a fear of failure and does this affects your performance in competition? Do you get distracted easily by things that go on around you in your environment? Do you become easily frustrated when things do not go according to plan? If you answered yes to any of the above then this program is for you! Grab your copy now for only $69.00! How Else Can You Tell When Mental Strength Training Is Needed? There are several indicators that mental strength training or coaching can help you rise above mental challenges and get more out of your talent. Below is a partial list of the common signals that a mental barrier is holding you back from peak performance. You perform much better in practice than during competition. Your practice game is flawless, but in competition, your performance is below par. You feel confident and loose in practice and then are plagued with doubt or indecision in the competitive arena. Something changes between practice and competition, but you just cannot put your finger on what it is. Usually fear of failure or tension holds you back. You have too many perfectionist qualities. Many athletes think that when they are successful, perfectionism is the reason why. Yes, there are some advantages to perfectionism such as high motivation and being goal-oriented. However, many perfectionist characteristics hold athletes back from success, such as holding onto high, unrealistic expectations, being overly critical of self, trying too hard, and getting easily frustrated. You don’t perform well when others are watching you. When others who you care about, (such as parents, fans, coaches) watch you perform, you become too self-conscious of their presence and lose your focus on the task. Often you may even worry about letting others down or failing in front of others, similar to stage fright or fear of embarrassment. Most likely you are afraid to embarrass yourself in front of others who are watching you perform because you fear how your performance might reflect on you as an athlete or a person. You maintain doubt about your sport before or during games. You perform with a lot of confidence in practice and gain confidence from practice, but when you play your sport for real, you start to entertain doubts about your ability to get the job done. I call this “competitive self-confidence” as opposed to “practice self-confidence.” You start to think, “Can I really beat this person across the net?” “Do I have what it takes to strike out this batter?” Doubts can be disguised subtly in the form of a simple question. When you question your ability to perform, it is really doubt in disguise. In the absence of confidence, you have doubt. When you have doubts, confidence suffers. You feel anxious or scared when you perform in competition. You perform freely and loose in practice and do not have many worries, but in games, you are paralyzed by fear and anxiety. Most often, athletes with a fear of failure get tight and anxious in games because they want to win so badly or have are afraid of embarrassment. Fear of failure causes you to try too hard and worry too much about outcomes. You limit your performance with strict expectations. With large amounts of practice and success in competition, comes both confidence and higher expectations. Confidence is what you want to let ride, but maintaining strict expectations equates to pressure, judgments, and demands you place on yourself. I spend a lot of time with athletes helping them identify limiting expectations and parking them in the locker room or parking lot prior to performance. I’ll talk more about this later in this book. You attach your self-worth to your ability to perform. Some athletes are driven to compete because of the rewards that come from being successful: fame, accolades, and respect. You have a desire to get your name in the paper, get praise from others, or rewards from your parents. These motivators, although help you feel better about yourself as a person, are not the best type of motivators. When you are doing well in sports, it’s easy for you to feel good about yourself, but when not performing well, it’s harder to feel good about yourself, as you attach your level of success to self-worth. You lose focus during crunch-time. When up to bat with the bases loaded, two outs and the game tied, you have trouble thinking clearly because of the pressure to produce for your coach, teammates, or fans. You forget the count or don’t pay attention to the sign from the coach. You commit simple mental errors that you wouldn’t normally do in other less threatening situations because you are unable to clear your mind and focus on the task. After an injury, you are physically 100% recovered, but you can’t perform the way you did pre-injury. Many athletes who have sustained a major sports injury have trouble regaining their confidence post-injury. Even after the doctor gives you a clean bill of health, your mental scars have not healed. You may be afraid of re-injury and this causes you to play tentatively. Alternatively, you may have lost your confidence and wonder if you can return to previous performance levels pre-injury. You have a burning desire to get better. You may not have an identifiable mental challenge or mental block in your sport, but you want to improve your mental game and win more. You think mental game coaching or mental training can help you improve and get to the next level. You want to do everything you can to get the edge over your competition, including the mental edge. This is another reason why I developed this program, “Mental Strength Training for Athletes.” You can use the program in the privacy of your internal world and the only way someone will know is by your results. Even today, professional athletes I work with do not want the public to know they are working with a mental strength coach. I certainly respect their concern for confidentiality, but it tells me that some athletes still think working with an expert in mental strength training should not be made public mostly because they do not understand what mental strength training is really about or are afraid of how the public views it. Most athletes seek out my services because of a particular performance barrier, slump, plateau, or decrease in performance. As a mental strength coach, I often become the last resort after athletes have tried several other means to get beyond performance slumps. Most athletes wait until they get into a slump or something needs to be “fixed” and they have exhausted all other resources before they commit to working on their mental game. Now you don’t have to wait till it’s too late. You can start working on your mental game today! Grab your copy for only $69.00! Only a limited number of athletes seek my services because they want to improve mental strength, with no apparent mental block, and improve performance. I find that coaches are more likely to bring in a mental strength coach to give the team every chance of being successful from the start of the season or pre-season. The real goal is to help a team identify barriers to teamwork and enhance performance by improving mental skills for success. The real value of mental strength training is helping athletes reach their peak potential and perform more often in the zone. My work is not always about helping athlete get over mental blocks in performance. My goal when working with athletes is to develop a mindset for performance success so they can get the most out of their physical ability every time they step onto the field, court, track, or course. Does Mental Strength Training Really Work? Researchers evaluating the effectiveness of mental strength training program come to the same conclusion: Mental strength training can improve performance across a wide variety of sports. In fact, as many as 85% of the studies conducted to evaluate MST showed positive performance effects (Greespan & Felz 1989; Meyers, Whelan, & Murphy 1996; Vealey 1994; Weinberg & Comar 1994). In general, the consensus of sport psychology researchers, coaches and athletes is that mental strength training can enhance performance. Mental strength training lends itself well to a philosophy aimed at athletes’ growth and development – physical, mental, social, moral and emotional. In fact, mental strength training is training in life skills like; how to set goals, how to handle pressure, how to handle criticism and how to stay focused on the task at hand. These skills do enhance sport performance and they also improve performance in area of life – school music, theater or career. “Mental Strength Training for Athletes” is about improving your attitude and mental game skills to help you perform your best by identifying limiting beliefs and embracing a healthier philosophy about your sport. 1. Improve focus and deal with distractions. Many athletes have the ability to concentrate, but often their focus is displaced on the wrong areas such as when a batter thinks “I need to get a hit” while in the batter’s box, which is a result-oriented focus. Much of my instruction on focus deals with helping athlete to stay focused in the present moment and let go of results. 2. Grow confidence in athletes who have doubts. Doubt is the opposite of confidence. If you maintain many doubts prior to or during your performance, this indicates low self-confidence or at least you are sabotaging what confidence you had at the start of the competition. Confidence is what I call a core mental game skill because of its importance and relationship to other mental skills. 3. Develop coping skills to deal with setbacks and errors. Emotional control is a prerequisite to getting into the zone. Athletes with very high and strict expectations, have trouble dealing with minor errors that are a natural part of sports. It’s important to address these expectations and also help athletes stay composed under pressure and when they commit errors or become frustrated. 4. Find the right zone of intensity for your sport. I use intensity in a broad sense to identify the level of intensity or activation that is necessary for each person to perform his or her best. This will vary from person to person and from sport to sport. Feeling “up” and positively charged is critical, but not getting overly excited is also important. You have to find the balance between being excited to complete, yet not getting over-excited or anxious. 5. Help teams develop communication skills and cohesion. A major part of mental strength training and mental training is helping teams improve cohesion and communication. The more a team works as a unit, the better the results for all involved. 6. To instill a healthy belief system and identify irrational thoughts. One of the areas I pride myself on is helping athlete identify ineffective beliefs and attitudes such as comfort zones and negative self-labels (i.e. “I’m a loser”) that hold them back from performing well. These unhealthy beliefs must be identified and replaced with a new way of thinking. Unhealthy or irrational beliefs will keep you stuck no matter how much you practice or hard you try. 7. Improve or balance motivation for optimal performance. It’s important to look at your level of motivation and just why you are motivated to play your sport. Some motivators are better in the long-term than others. Athletes who are extrinsically or externally motivated often play for the wrong reasons, such as the athlete who only participates in sports because of a a parent’s desire. I work with athlete to help them adapt a healthy level of motivation and be motivated for the right reasons. 8. Develop confidence post-injury. Some athletes find themselves fully prepared physically to get back into competition and practice, but mentally some scars remain. Injury can hurt confidence, generate doubt during competition, and cause a lack of focus. I help athletes mentally heal from injuries and deal with the fear of re-injury. 9. To develop game-specific strategies and game plans. All great coaches employ game plans, race strategies, and course management skills to help athletes mentally prepare for competition. This is an area beyond developing basic mental skills in which a mental coach helps athletes and teams. This is very important in sports such as golf, racing, and many team sports. 10. To identify and enter the “zone” more often. This incorporates everything I do in the mental side of sports. The overall aim is to help athletes enter the zone by developing foundational mental skills that can help athletes enter the zone more frequently. It’s impossible to play in the zone everyday, but you can set the conditions for it to happen more often. “Mental Strength Training for Athletes” may not be appropriate for every athlete. Not every person wants to “improve performance.” Mental strength training is probably not for recreational athletes who participate for the social component and to have a fun weekend. Moreover, if you do not spend time improving fitness or working with a coach, most likely you will not adhere to a mental strength coaching program. Mental strength training does apply to a wide variety of serious athletes. Most of athletes (junior, high school, college, and professional athletes) are highly committed to excellence and seeing how far they can go in sports. They love competition and testing themselves against the best in their sport. They understand the importance of a positive attitude and mental toughness. These athletes want every possible advantage they can get including the mental edge over the competition. Through out the program we’ll look at the metal strength tools and how they will assist you in developing your mental strength skills. I’ll make some suggestions and give guidance as to how you can develop your personal mental strength playbook. Section One - Is the Foundation. The Foundation is help you get an overview what is mental strength training and how your mind works. The Foundation will assist you in using the tools in the Tool Box section. You’ll also get a workbook to ensure that you are practicing the specific mental strength skills. In total you’ll get over 140 pages of cutting edge mental strength information and a workbook with over 40 pages of exercise. For a limited time, all this for only $69.00! Much, much cheaper than hiring me @ $150/hr. I love sports! And I know I can’t coach every athlete our there and not every athlete can afford me. So this is my gift to the sporting community. I’m so convinced that this method will work for you, as it has for all of my athletes, that I offer a satisfaction guarantee. If you follow this system exactly for 90 days and you DO NOT begin to see measurable improvements in your athletic performance, I will provide you with a free one-on-one coaching session and your money back…yes it’s that good! NOTE: “Mental Strength Training For Athletes” is a downloadable course consisting of PDF files. After you order, you will get INSTANT ACCESS to this performance changing information and can begin to use the information immediately. 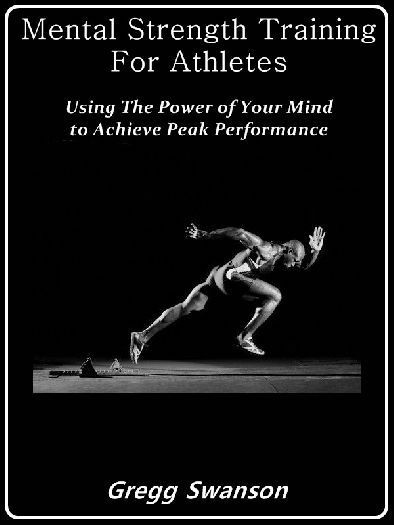 “Mental Strength Training For Athletes” will help you develop the power to take control of your thinking about your athletic performance before, during and after the event. Get your copy today! Amazing Bonus When You Order Today! Order your copy today and I’ll provide this amazing bonus - “Mental Strength of a Champion - Creating a Winning Mindset”! This program sells for $137 and I’ll give it to you when you’re order “Mental Strength Training For Athletes” today! With this amazing bonus you’ll receive:“Mental Strength of a Champion - Creating a Winning Mindset” program has 2 e-books and 12 audio tracks. Performance Enhancer – This is a special session to familiarize you with the “zone” state. It starts by relaxing you deeply, and then ramps to Beta while the relaxation is carried over. The end result is a state of relaxed alertness, where Alpha and Beta waves blend to form a perfect state for athletic performance. This session is best used with visualization techniques, Anchoring and Audio Cues (Triggers). Athletic Performance Anxiety – If you are an Athlete, It is vitally important that you learn to relax. Tense muscles take much more energy to use. If you are relaxed and loose, you will last longer and move and respond effortlessly to any situation. Pre-Exercise Focus Session – This session will help prepare you for a workout. Post-Workout Recovery – This session will help you recover from a workout. Insomnia and Sleep Induction Sessions – Sleep is incredibly important for athletes, especially the night before an athletic event. Most athletes will have trouble sleeping before a big event, so if you get a deep, healthy, full night’s rest you will likely have an advantage over the competition from the beginning. Wake Up Session – Use this session to help jump-start a day of intense training. So go ahead and now order “Mental Strength Training For Athletes” by clicking below.